Pre-90's Anime/Manga Fun! As the title says, basically make a wall of any anime or manga made before the '90s. No restrictions whatsoever on the wallpaper style, so it can be grunge, vector, paint, you name it. HOWEVER, the wall needs to stay true to the spirit/mood/feeling of the series or movie while being creative at the same time. So ideally the judging breakdown would be 50% true to anime and 50% creativity. But anyways, the background was remade based on the scan I've got from AnimePaper. Got another building vector from Stock Xchange, extracting Gundam Psycho from the scan which was behind Camille and Four and then adding another extracted Gundam Zeta from another scan, blending them, brushing around... all of these took about 1 week. And thanks to Kozaihod for checking and helping me with the wall. Errr... Sofia, I thought it's Kamille. Oh well, maybe my mistake. And I remember you saying that you used to hate him. Nice! I like the background and the characters look awesome. Keep it up! 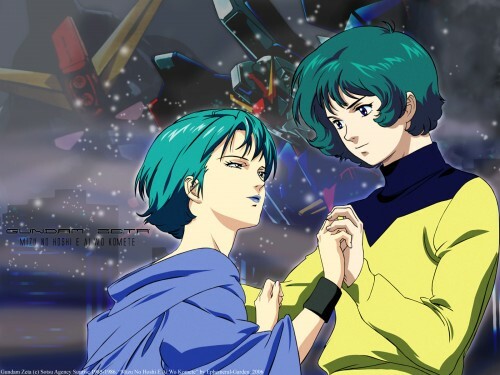 Great wallpaper of Zeta Gundam's Kamille and Four. Thanks for posting and fantastic job! wallpaper made with so much win. tears.